It’s Time D-Heads! 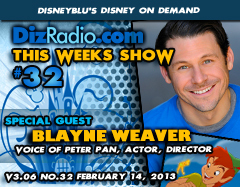 Let’s have some Faith, Trust and Pixie Dust and head to Neverland as we welcome the Voice of Peter Pan, BLAYNE WEAVER to the show! Blayne, the current Voice of Peter Pan, Actor, Director, Writer, is stopping in talk about being part of a legacy and Disney icon in the films and the parks, his newest projects, current films and more! We have a ton of Disney News hot off the D Wire. The D-Team is back once again with their segments. Jamey returns with The Artists Corner looking into Walt’s Animators, and our D-Team Member from down under Lexie is here with her look into Hollywood as she explores the history of our Guest Blayne Weaver. Jason is here with The Vault uncovering more Disney Classics on Blu-Ray and DVD. We have all kinds of fun as we think of a happy little thought and Fly to Neverland.